Google has confirmed a major algo update in their search results that was released this week. Danny Sullivan from Google confirmed this via twitter after many SEOs noticed major fluctuations in rankings. He also confirmed that this is similar to some of the previous broad core algo updates we’ve seen to the search results, such as the one in March. When he announced this week’s algo update, he also retweeted the previous announcement from March. 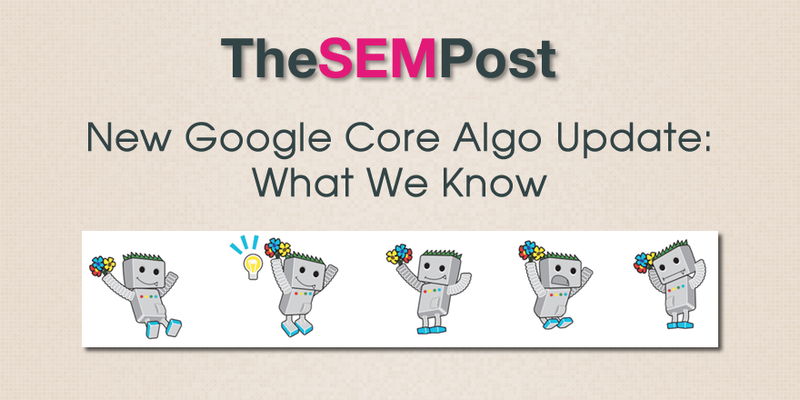 Now with Google’s core algo updates, this generally means that there’s not anything actionable that can be done by site owners to counteract any lost rankings they saw with this change. Sometimes with targeted algo updates, Google is targeting something specific, such as interstitials or page speed, and these are the types of things that site owners can generally change or fix in order to regain lost rankings. But with core algo updates, there’s usually nothing targeted like this except the general quality of content and pages in the search results. In March, Google stated specifically that there was nothing wrong with pages that were not ranking as well, they were simply rewarding pages that were under performing previously. So there is no quick fix of things that site owners could change about their pages that lost rankings. With this week’s change, Sullivan reiterated the same. He said when there’s something actionable, they try to give more details about it so site owners can adjust. But again, in this case there’s nothing specific to do. He also says that he hopes site owners don’t rush and change what they think could be impacted, and “think more broadly.” And he recommends the quality rater guidelines, which were just updated last week, as a great starting point for site owners to consider. And he specifically cites great content, something that both Gary Illyes and John Mueller from Google have said repeatedly too. Sullivan commented that he feels it is actually helpful by not telling site are specifically what an algos targeting, if it’s a broad core algo update. And there are many site owners who don’t feel the same way, because they want at least something concrete to go on when making improvements, that is not just a broad stroke “improve quality.” And despite these comments from Sullivan, it doesn’t stop the SEOs from speculating the things that were or were not targeted by any broad algo change. I am "they." I've helped push for us to share more & be more specific, when we can. I also helped push that we should share when we do the broad updates and that explaining there's nothing specific "broken" is a good message rather than just saying "update!" and nothing else…. However, when part of the Japanese Google Webmaster team shared the post, they also included that if you are impacted by the update you should create quality content that users are searching for. This week we have updated a wide range of core algorithms. This is done several times a year, what you can do for the impact received by this update is to make high quality content that the search users are searching for as always. For details please see the English post. So this is slightly more specific guidance than what Sullivan was giving, although not by much. Current weather and ranking tools are not showing huge changes right now, which is quite different from some of the more impactful core algo changes we have seen in the past. But because we do not have more details about the rollout, it could be that it is a slow rollout and we will see a better picture on how sites were affected within a few days.